Buy a Demon Devil calligraphy wall scroll here! Not the results for demon devil that you were looking for? 魔羅 Māra, killing, destroying; 'the Destroyer, Evil One, Devil' (M.W. ); explained by murderer, hinderer, disturber, destroyer; he is a deva 'often represented with a hundred arms and riding on an elephant'. Eitel. He sends his daughters, or assumes monstrous forms, or inspires wicked men, to seduce or frighten the saints. He 'resides with legions of subordinates in the heaven Paranirmita Vaśavartin situated on the top of the Kāmadhātu'. Eitel. Earlier form 磨; also v. 波 Pāpīyān. He is also called 他化自在天. There are various categories of māras, e.g. the skandha-māra, passion-māra, etc. Outside doctrines; non-Buddhist; heresy, heretics; the Tīrthyas or Tīrthikas; there are many groups of these: that of the 二天三仙 two devas and three sages, i. e. the Viṣṇuites, the Maheśvarites (or Śivaites), and the followers of Kapila, Ulūka, and Ṛṣabha. Another group of four is given as Kapila, Ulūka, Nirgrantha-putra (Jainas), and Jñātṛ (Jainas). A group of six, known as the外道六師 six heretical masters, is Pūraṇa-Kāśyapa, Maskari-Gośālīputra, Sañjaya-Vairāṭīputra, Ajita-Keśakambala, Kakuda-Kātyāyana, and Nirgrantha-Jñātṛputra; there are also two other groupings of six, one of them indicative of their various forms of asceticism and self-torture. There are also groups of 13, 1, 20, 30, 95, and 96 heretics, or forms of non-Buddhist doctrine, the 95 being divided into 11 classes, beginning with the Saṃkhyā philosophy and ending with that of no-cause, or existence as accidental. deva-māra, 魔羅 one of the four Māras, who dwells in the sixth heaven. Paranirmita-vaśa-vartin, at the top of the Kāmadhātu, with his innumerable host, whence he constantly obstructs the Buddha-truth and its followers. 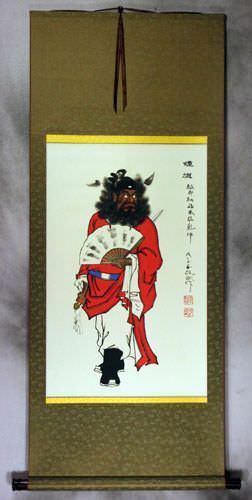 He is also styled 殺者 the slayer; also 波旬 explained by 惡愛 sinful love or desire, as he sends his daughters to seduce the saints; also 波卑 (波卑夜) Papiyan, the evil one. He is the special Māra of the Śākyamuni period; other Buddhas suffer from other Māras; v. 魔. Some people may refer to this entry as Demon Devil Kanji, Demon Devil Characters, Demon Devil in Mandarin Chinese, Demon Devil Characters, Demon Devil in Chinese Writing, Demon Devil in Japanese Writing, Demon Devil in Asian Writing, Demon Devil Ideograms, Chinese Demon Devil symbols, Demon Devil Hieroglyphics, Demon Devil Glyphs, Demon Devil in Chinese Letters, Demon Devil Hanzi, Demon Devil in Japanese Kanji, Demon Devil Pictograms, Demon Devil in the Chinese Written-Language, or Demon Devil in the Japanese Written-Language. 5 people have searched for Demon Devil in Chinese or Japanese in the past year.